Today I wanted to take a look at a few of the best made watches for the money when it comes to chronograph timepieces specifically. I really enjoyed putting today’s list together, there’s a range of affordable, mid range, and luxury watches on show today. I’m sure it’s going to cause a few arguments, although I don’t see anything wrong with that, everyone has different opinions, plus, that’s exactly what the comment section at the end if for, have you say and tell everyone what you think should have made it in our list of chronograph watches that offer value for money. If you have any questions about any of the watches features below simple comment at the bottom and I’ll try and help you out as best I can. For now, enjoy today’ list. When it comes to value for money, Swiss watch brand Alpina surely hit the nail on the head. This model is from their Startimer Pilot series and features this striking black PVD stainless steel casing that’s accompanies by a brown tan genuine leather strap. The military green dial stands out well with luminous tan hands and Arabic style numeral hour markers. The three chronograph sub-dials display a 60 second, 30 minute, and 1.10th of a second. There’s also a date display at the 6 o’clock position that just fits in excellently. 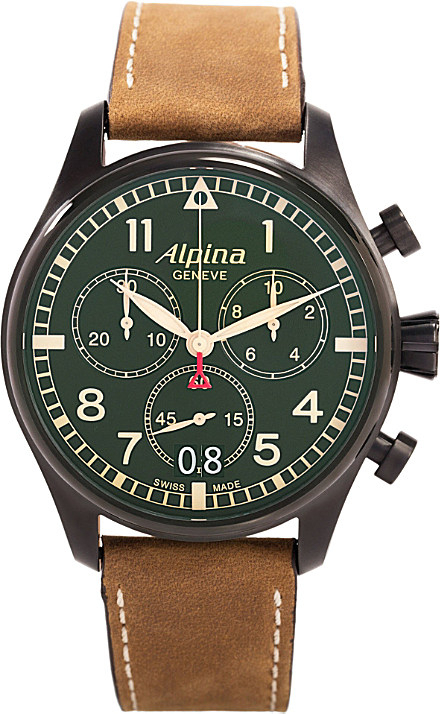 Powering this Swiss made Alpina watch is a 13 jewel quartz movement, caliber AL-372. A sapphire crystal glass provides you with excellent protecting against scratches. This chronograph pilot watch also has a 100m water resistance rating. Note that the crown on this model does screw down. You can read my full AL-372GR4FBS6 Alpina watch review here soon. 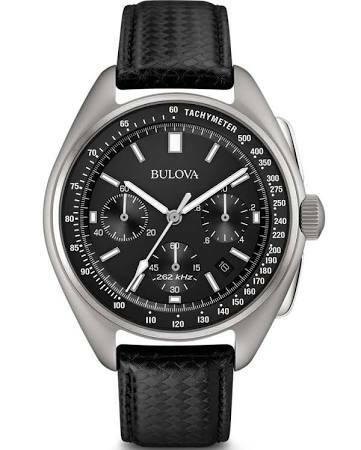 When it comes to best watches for the money Bulova are one of my favourite brands. They’re definitely a more affordable watch brand, but the quality is still there. This is a pretty well known Bulova timepiece, it’s the special edition moon watch. Its design is inspired by the Bulova chronograph watch worn during the Apollo 15 moon landing in 1971. This newer moon watch has been authentically recreated and features up to date technology. At the heart of this Bulova chronograph watch is an impressive precisionist movement for excellent levels of accuracy. This high performance quartz movement has a frequency of 262 kHz. This gives the second hand a smooth sweeping movement. The dial also features superluminous hands and hour markers to make the watch easier to read in dim lit conditions. An anti-reflective sapphire crystal glass protects against scratches and helps to prevent glare on the dial. The Bulova moon chronograph watch has a 50m water resistance rating and actually comes with a secondary black nylon strap with a nubuck leather patch to commemorate the date of the mission. You can read my full Bulova Moon watch review here. Here we have a fairly expensive Swiss watch that still manages to offer value for money. If you love the white style of minimalist watches then the design of this dial might appeal to you. The silver-tone hands and hour markers stand out nicely against the brilliant white background of the dial. This has been paired up with a genuine leather alligator strap that fastens with a deployment clasp. The dial also features 3 chronograph sub-dials that display 12 hour, 30 minute, and 60 seconds. There’s a useful date display at the 3 o’clock position. Powering this Swiss chronograph watch is a Swiss automatic movement for excellent timekeeping. Like the previous watches, a sapphire crystal glass protects against scratches and knocks. 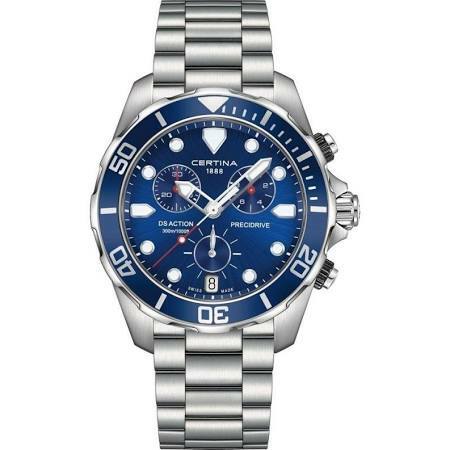 This Swiss automatic chronograph watch only has a 30m water resistance rating. You can read my full 8591 Baume & Mercier watches review here soon. You’re probably well aware of Hamilton’s Khaki Field collection, but did you know it included this stunning chronograph timepiece? If you’re after the best made watches for the money, Hamilton are certainly a brand you should be considering. The Hamilton Khaki chronograph features a highly polished stainless steel casing with a diameter of 42mm and a thickness of 15mm. This is paired up with a soft genuine leather strap that fastens with a buckle style clasp. On the dial, we have two sub-dials that display a 30 minute and 12 hour counter, as well as a day and date indicator at the 3 o’clock position. Both the hands and hour markers have a coating of lume for better visibility in dim lit conditions. The engine powering this chronograph timepiece is a Swiss made Hamilton Calibre H-21 automatic movement, this has an incredible 60 hour power reserve when fully wound. A sapphire crystal lens gives you a very high level of protection from scratches and knocks. This Hamilton chronograph watch also has a 100m water resistance rating, note that the crown does screw down on this model. 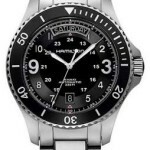 You can read more about Hamilton Khaki Field watches here. 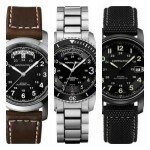 When it comes to cool chronograph watches in terms of style and value for money, Victorinox are worth taking a look at. Victorinox are another one of my most recommend Swiss watch brand when it comes to value for money. 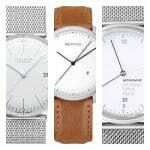 Not often do you find brands that produce such a variety of Swiss watches for such affordable prices. 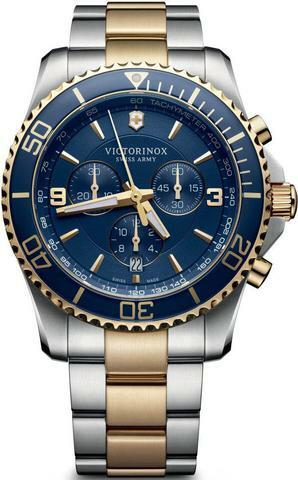 The Victorinox Swiss Army Maverick features this stunning two tone design and a beautiful dial that combines this dark blue finish with gold-toned detailing for the hands and hour markers. The hands have a coating of lume for better visibility in dim lit conditions. The three sub-dials on display include a 60 second, 30 minte, and 12 hour indicator. There’s also a useful date display at the 6 o’clock position on the dial. Powering this affordable Swiss-made chronograph watch is a Swiss quartz movement. This gives you excellent timekeeping and reliability, as well as needing very little maintenance. The sapphire crystal glass that protects from scratches has an anti-reflective coating, this helps to prevent glare. The watch also has a 100m water resistance rating. You can read my full Victorinox watches review here. 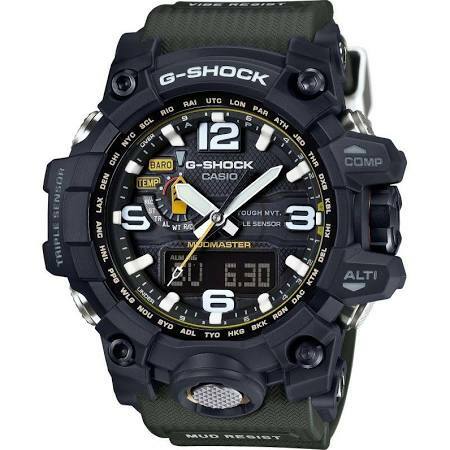 Up next I have the new Mudmaster model from casio’s G-Shock range. Perhaps you weren’t expecting a dual digital analogue watch in today’s list. I don’t blame you, I was considering leaving this out, however, you can’t deny the value for money that the G-Shock range offer. G-Shock’s Mudmaster collection was specially designed for people who work in areas where piles of rubble, dirt, and debris are present. That’s exactly why this timepiece features a special vibration-resistant construction that’s designed to stand up to wear whilst operating cutters, crushers, drills, and other heavy machinery. A multi gasket design is used on the pipes that the buttons and shafts use to keep mud out. The crown also screws down along with the screw lock bezel to further ensure and increase the level of mud resistance. It won’t be any surprise to most people that this G-Shock Mudman features a range of impressive functions. Some of these include a digital compass, barometric pressure/altitude, temperature reading, double LED light, multiband 6, and a Tough Solar movement. All in all, a very high tech chronograph watch that offers great value for money. Certina’s Precidrive DS collection are another selection of watches that offer brilliant value for money. Precidrive is the innovative technology that ensures the highest levels of accuracy for Certina. If you spot a Certina timepiece with a Precidrive quartz movement it means the watch achieves real chronometer precision with a rate deviation of +/- 10 seconds per year. This makes it 10 times more accurate than a traditional quartz watch, talk about the best made watches for the money. This Swiss value watch features a beautiful blue bezel and dial that stand out on your wrist along with the stainless steel 42mm casing and strap. It uses a DS-Concept system which is Certina’s Double Security system. It makes use of a complicated system of seals to protect the stem and crown, along with a reinforced caseback and a scratch resistant sapphire crystal glass. You can read my full Certina watches review here. When it comes to well made Swiss chronograph watches Tissot actually has a nice range of good affordable timepieces available. This is the Tissot Couturier, a watch that’s featured in many of our top watch lists over the years. The black dial features luminous silver coloured hands and baton style hour markers for better visibility in dim lit conditions. There’s a date display at the 3 o’clock position along with three sub-dials that display a 60 second, 30 minute, and 1.10th of a second timer. 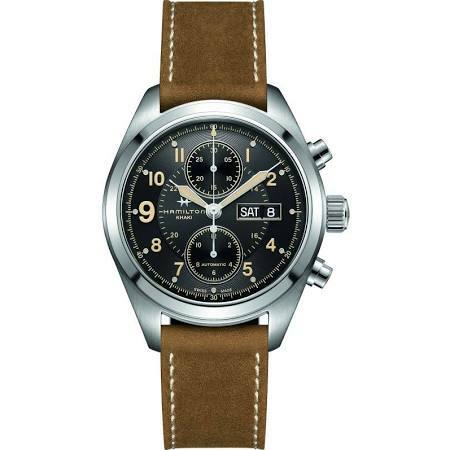 Powering this affordable Swiss chronograph watch is a ETA caliber C01.211 movement with a power reserve of 45 hours. A high end sapphire crystal glass gives you a very good level of protection against scratches and knocks. 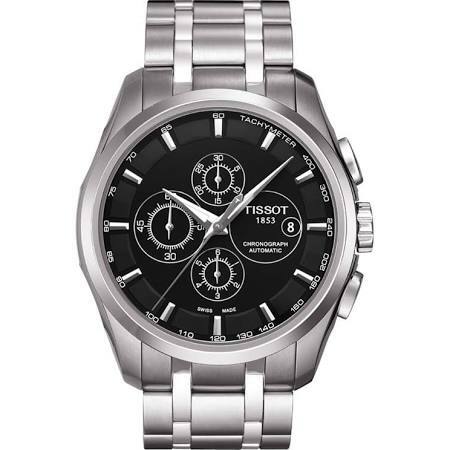 This Tissot watch also has a 100m water resistance rating. You can view my full Tissot watches review here. This is one of my favourite simplistic minimalistic watches with its iconic design that stays true to the original penned by Max Bill in the 1960’s. 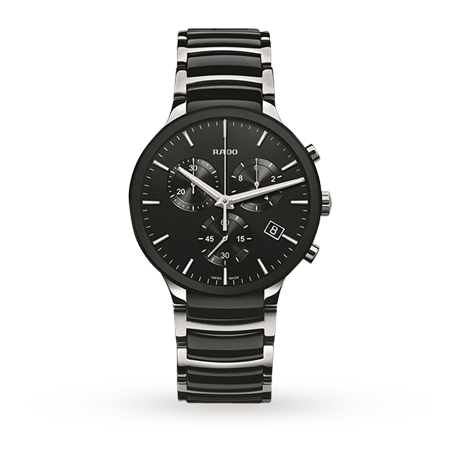 The Junghans Max Bill Chronoscope is a refined and elegant timepiece with excellent dial design. 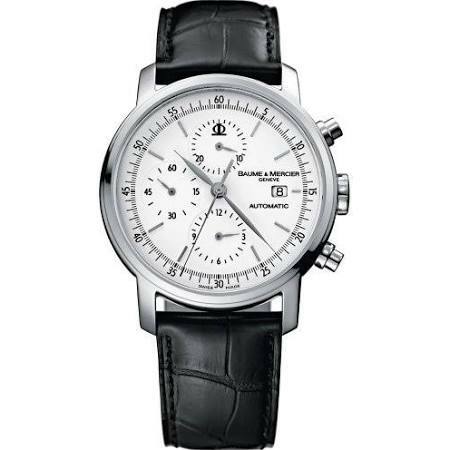 At the heart of this German-made chronograph watch is an automatic self-winding chronograph J880.2 movement. That’s a 25 jewel movement with a 42 hour power reserve. This features a 30 minute and 12 hour chronograph counter as well as a date function at the 3 o’clock position on the dial. 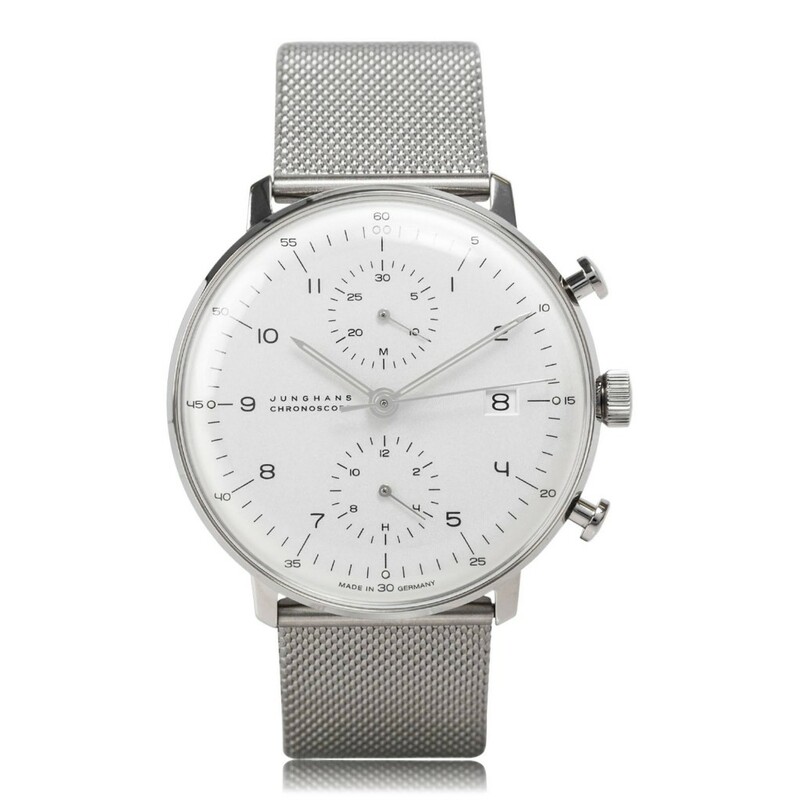 If you love minimalistic watches and can afford it, the Junghans Max Bill Chronoscope certainly offers excellent value for money. 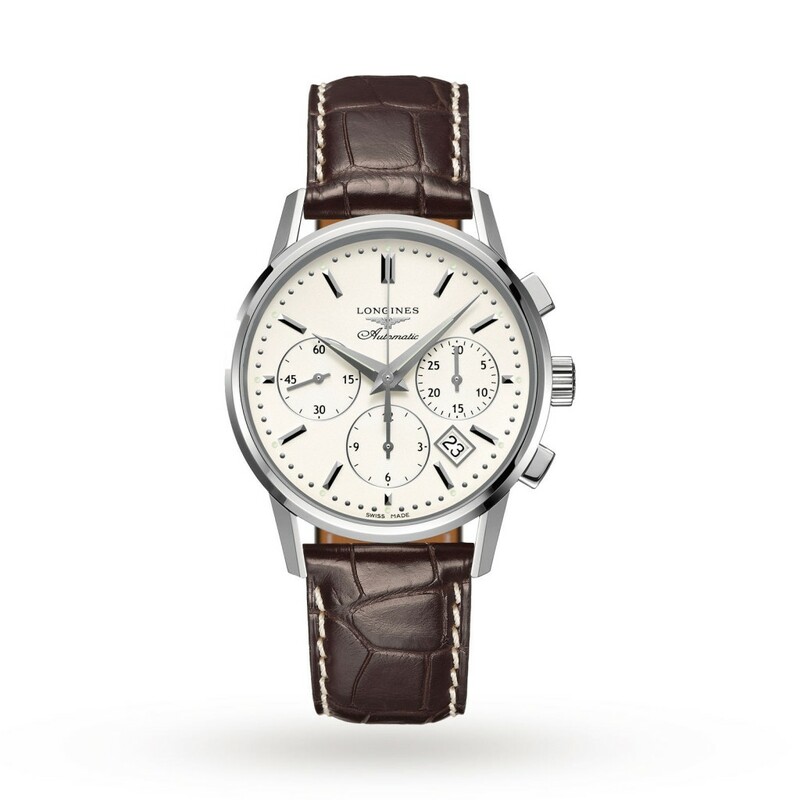 In at number 10 we have the Longines Flagship Heritage watch, an incredible Swiss chronograph watch that’s perfect for those who prefer something a bit more luxurious. Luxury and value for money are sometimes a little hard to put together but I feel this Longines automatic chronograph does the job well. This Longines watch features a polished 41mm stainless steel casing that’s complemented with a brown alligator leather strap for excellent comfort on your wrist. It features a striking dial design with a cream coloured background and silver toned hands and hour markers. Powering this Longines watch is an L688 caliber Swiss automatic movement with a 54 hour power reserve. It has a 27 jewel design and beats at 28,800 BPH giving you a smooth sweeping second hand. A sapphire crystal glass gives you excellent protection from scratches too. This model has a 30m water resistance rating. You can read my full Longines watches review here soon. Perhaps you’re looking for something different in your hunt for chronograph value Swiss watches. The Rado is an excellent choice for those seeking something striking that will stand out on your wrist. I love the tapered light weight Gloss ceramic bracelet on this timepiece, it offers both comfort and beautiful design. Powering this Swiss chronograph watch is a Swiss made quartz movement that gives you excellent accuracy and reliability. A sapphire crystal glass gives you the high level of scratch protection you’d expect from such a high end timepiece. Mido prides itself on combining functionality, aesthetics, and authenticity within its watch designs. Mido watches are perfect for those who love refined and understated quality watches. This Mido chronograph watch features a truly elegant dial design with a textured background and a mixture of dot and baton style hour markers. There are three chronograph sub-dials on display which show a 60 second, 30 minute, and 12 hour timer. There’s also a popular day and date function on display at the 3 o’clock position. An automatic self-winding Swiss made chronograph movement powers the watch. They’ve used a sapphire crystal glass as it provides excellent scratch protection. 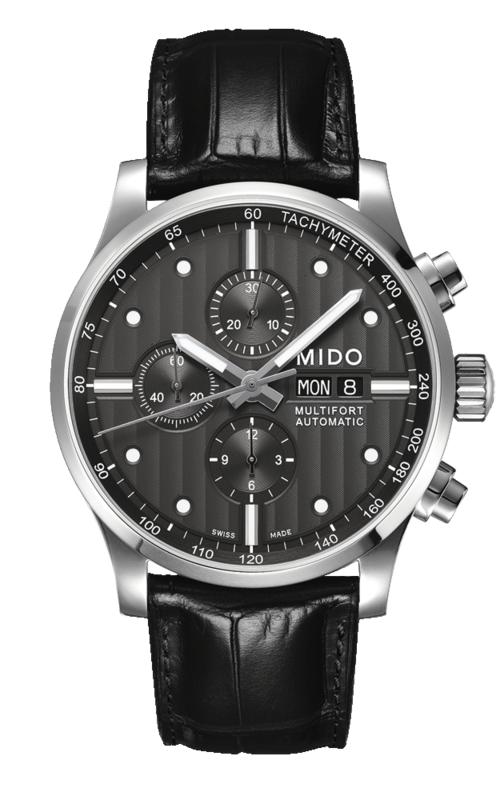 This Mido chronograph watch also has a 100m water resistance rating. You can read my full Mido watches review here soon. Omega is a luxury Swiss watch brand that really doesn’t need an introduction. 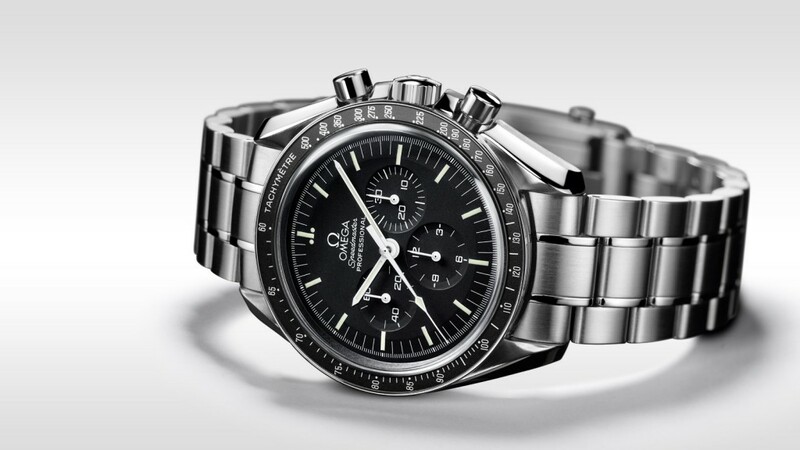 Omega supplied NASA with the Speedmaster Professional which became the first watch worn on the moon, this was during the Apollo space missions. It’s also the official timekeeper to the Olympic games. This incredibly engineered watch features a 42mm stainless steel casing which houses the black dial with white detailing. The hands and hour markers are coated in high quality lume for excellent visibility in dim lit conditions. Protecting the front of the watch is a hesalite crystal glass. At the heart of this Omega watch is a Swiss made Omega 1861 manual winding chronograph movement with a Rhodium-plated finish. It has a 48 hour power reserve when fully wound. The model features a 50m water resistance rating. Last up on today’s list of the best chronograph watches that offer value for money is the Swiss made Pontos automatic from Maurice Lacroix. Maurice Lacroix are another one of my top Swiss watch brands. The Pontos is built with a 43mm stainless steel casing that has a thickness of 15mm. This is combined with a soft genuine leather strap that fastens with a push release clasp. This casing actually features an exhibition-style caseback to allow you to view the movement working away through the rear of the watch. The dial features three chronograph sub-dials which display a 60 second, 30 minute, and 12 hour timer. A date indicator sites in the 6 o’clock position on the dial as well. 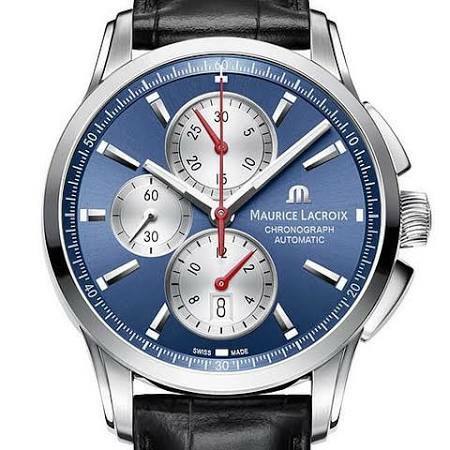 Powering this popular Maurice Lacroix watch is a Swiss made automatic chronograph movement caliber ML112. This is a 25 jewel movement that beats at 28,800 BPH to give you a wonderful sweeping second hand. An anti-reflective sapphire crystal glass also protects against scratches. This model has a water resistance rating of 100m and features a screw down crown. You can read my full Maurice Lacroix watches review here. As always, thanks for taking the time to read through today’s latest post. What would you say was the best watch for the money in today’s list? Comment below and let us know. The Watch Blog is a participant in the Amazon EU Associates Programme, an affiliate advertising programme designed to provide a means for sites to earn advertising fees by advertising and linking to Amazon.co.uk. Copyright © The Watch Blog All rights reserved.